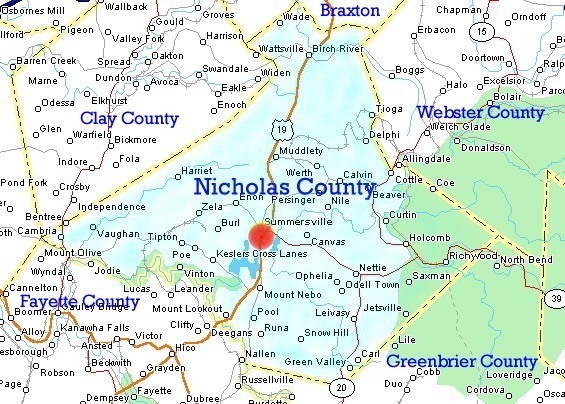 Nicholas County WVGenWeb is dedicated to making genealogical reference materials pertaining to the Nicholas County, West Virginia area freely and openly available on the Internet. We are a group of volunteers who contribute our efforts, talents and resources to make that goal a reality. We always welcome your ideas, suggestions, and especially your help! The County Coordinator for Nicholas County is Rick Greathouse. WVNICHOL is a mailing list dedicated to Nicholas County genealogy. Click here for information on joining the list or accessing the archives. Click here to visit the Nicholas County message board on Ancestry.com. Why Login? Lost Password? Want to Register? Nicholas County was formed in 1818 from Greenbrier, Kanawha, and Randolph. It was named for Wilson Cary Nicholas, Governor of Virginia 1814-1816. County seat is Summersville which was established in 1824 and named for Judge Lewis Summers who help create the county. Summersville was a major crossroads in the old historic Pocohontas Trail. In July, 1861, a Confederate spy named Nancy Hart led an attack on Summersville which captured the Union forces and their leader, Captain Starr. Most of the town was burned. To access the USGenWeb Archives for Nicholas County West Virginia click here.